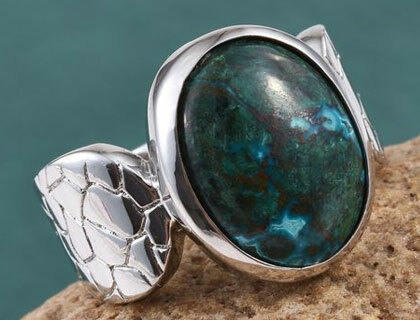 Often found being confused with turquoise, Chrysocolla is a gem unheard of by many! Presenting an amalgamation of lustrous and intense hues, one glance at the stone’s submerging beauty is enough to steal your breath away. Looking like the play of ocean, it has a beauty like never seen before! Find an exclusive display of the jewellery studded with it, in earrings, rings, pendants, and much more, exclusively at TJC! Hugely coveted for its appearance of transitioning colours and shades, this stone belongs to the same family of copper-bearing gems as malachite, azurite, larimar, and turquoise. One of the lesser known stones, Chrysocolla still holds the power to keep you spellbound with its beauty. If we’re to talk about the origin of the name, it comes from the Greek words “chrysos” and “kola,” which mean “gold” and “glue,” respectively. The name originated from its use, which was in the process of smouldering gold. However, over the years, it started being used for jewellery purposes. When it comes to the sourcing of the stone, it is procured from a lot of places. Even though, it is a lesser-known stone, its mining is done at a number of locations including, Israel, Chile, England, Mexico, Peru, Russia, and the United States of America. We import our stones from the mines of Australia, where you can find the most consistently high-grade supply. Coloured with rich, almost blue-ish shade of green, chrysocolla is often found being confused with turquoise. Some recent studies have concluded that it is a mixture of spertinite, silica, and water. The copper presence in its make lends it the green colour. When it comes to the clarity of the stone, it is most commonly found opaque. Sometimes, you can also get the almost translucent quality. The stone does not go under any treatment. However, a layer of resin is applied on the surface of the stone to make it shine. The stone, when polished, is highly vitreous. The greasy texture of chrysocolla ensures that it throws off the most majestic and alluring display of its animated colours. Speaking of the cuts, crysocolla is often found in cabochons. There might be some stones that are faceted. But mostly the stone is left without any facets. The most popular shape of this stone is oval or round, however, you can find some fancy free shapes as well. Chrysocolla holds a lot of power and reverence in the healing world. It is believed that the stone holds the power of communication. It aids smoother flow of conversation, empowerment, as well as teaching. In addition to it, like all the other crystals, it also tends to clean out all the negative energy from the room and replace it with positivity. Many healers across the world regard it as a peaceful stone. It eliminates the chances of misunderstandings and hostility. It also encourages passion and peace. More popularly, it is known as the teaching stone as it teaches compassion and endearment to the wearers. Many tribes also consider it as the stone of wise women. It is believed that new grandmothers as well as great-grandmothers wear the stone to help them take on their role as the caring and wise woman of the household. It is also regarded as a talisman to the musicians, as it acts as just the ideal charm to facilitate learning of new musical instruments. It should be noted that this stone is a relatively softer crystal as compared to all the rest, with it rating at only 2.5 to 3.5 on the Mohs scale of hardness. Therefore, you need to be extremely careful while you’re wearing it as it is prone to breaking. You should also know that it is very susceptible to scratches and external abrasions. You are advised to remove the jewellery studded with this stone if you’re planning any outdoor excursion, sport activity, or even indoor manual chore. However, when it comes to the cleaning of the stone, it is fairly easy. All you have to do is wash it under a stream of cool water. If you’re not satisfied, you can also wash the stone in a bowl full of warm soapy water. Just be very careful and gentle. After washing, use a soft cloth to wipe it dry. It is preferred if you store the jewellery wrapped up in a cloth. It only rates from 2.5 to 3.5 on the Mohs scale of hardness, which makes it an extremely weak stone, hence needing gentle care. Chrysocolla is a one hundred percent naturally-occurring stone and is not treated in any way. It is pertinent to note that you should not expose the stone to steam cleaners or ultrasonic cleaners as it is very much prone to damage. Due to its vivid green hues, it is most often been found to be confused with turquoise. However, it is a lesser-known stone, it is abundantly available across various locations in the world.